For more information on One Love Pets visit their website and" like" them on Facebook for updates! 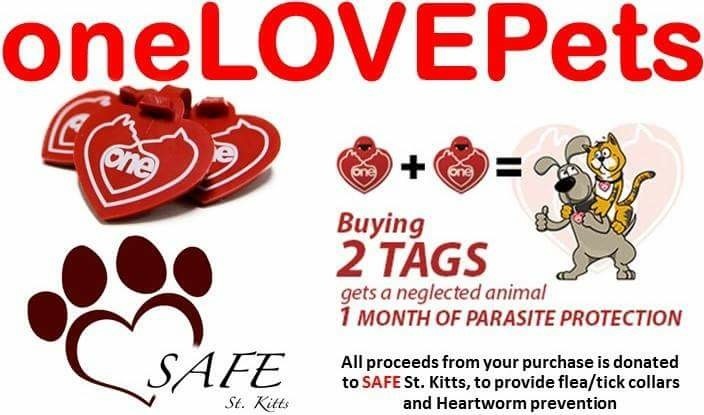 SAFE is proud to announce our partnership with One Love Pets to expand our mission further into the St. Kitts community! One Love Pets is a non-profit organization dedicated to raising awareness to the importance of parasite protection in our pets. Show your support and help raise awareness by purchasing a One Love Pets pet tag that can be proudly displayed by your pet or by you on your keys, luggage, bags, etc! The purchase of 2 tags allows SAFE to provide parasite prevention to an animal in need on St. Kitts for one month!